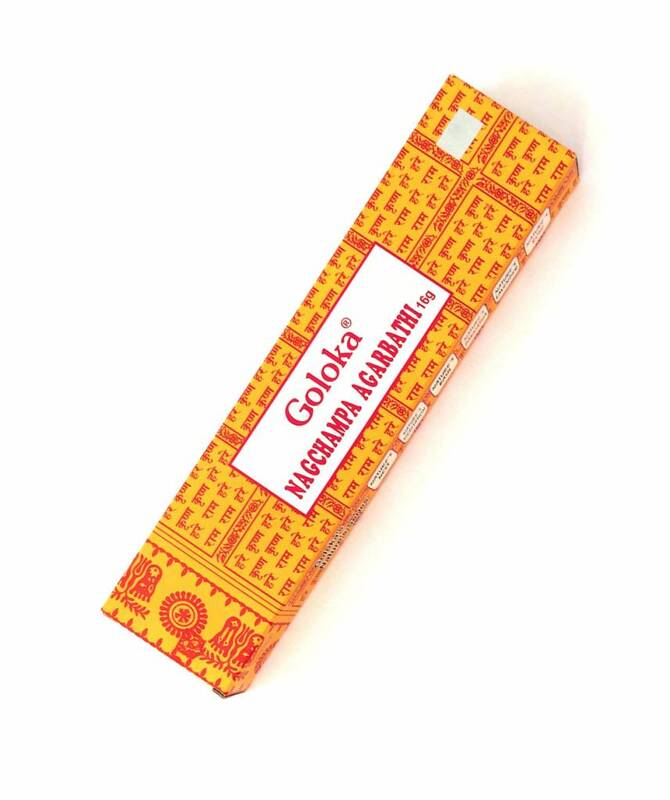 Goloka, Nagchampa Agarbathi Incense, a wonderful fragrance for relaxation, peacefulness and relief. Also very good for purifying spaces and to open the Chakras. With Darshan the bestsellers from Indian. Suitable for yoga and meditation. Goloka, Nagchampa Agarbathi is one of the worlds famous incense. It has gained popularity and is now sold all over the world. It is hand rolled onto a bamboo stick in India. For most people it is, along with Satya Sai Baba Nag Champa Agarbathi Incense, a pleasant smelling incense. Sweet and spicy sected and yet not too heavy and a little different than the other Nag Champa. Contains essential oils and 100% natural herbs. This incense is with its relativistic and relieving effect, ideal for yoga and meditation. These incense sticks are high quality sticks and handmade in India.